The R.E. Ginna nuclear plant and Rochester Gas & Electric have reached an agreement to provide a financial lifeline for the plant through March 2017, 18 months earlier than originally proposed. The plant’s owner states in an analysis included in the filing that the plant will not be financially viable when the agreement ends. Under a joint proposal filed late Wednesday with the New York Public Service Commission and FERC, the new reliability support services agreement would end March 31, 2017 (14-E-0270) (ER15-1047). An earlier agreement between Exelon subsidiary Constellation Energy Nuclear Group and RG&E — which was ordered by the PSC but rejected by FERC — ran until Sept. 30, 2018. Payments to Ginna would not start until FERC approves the agreement, the settlement says. The agreement calls for RG&E to apply up to $110 million in existing customer credits toward the costs of the RSSA. Ratepayers will be on the hook for a $2.25 million monthly surcharge beginning Jan. 1, 2016, through at least June 30, 2017. If the customer credits are insufficient to cover the cost of the agreement, the surcharge will continue until the balance is paid off. Those payments may continue after the plant is shut down. “Based upon my review of Ginna’s projected operating costs for the 18-month period starting after the RSSA expires and my calculation of how much market prices must increase before Ginna’s re-entry into the market would become economic, it appears highly unlikely that there will be an incentive for Ginna to return to the market after RSSA termination,” Jeanne M. Jones, vice president of nuclear finance for Exelon and CFO of CENG, wrote in an affidavit. The plant’s prospects are dim because forecasted market prices are lower than a baseline the company set in a 2014 analysis, and insufficient to cover the plant’s operating costs, Jones said. The conclusion of the RSSA also coincides with the need for an 18-month refueling, further weakening the plant’s financial outlook. The new RSSA retains financial disincentives in the earlier agreement to prevent the plant from toggling between the RSSA and market payments. This mechanism, the capital recovery balance, required Ginna to pay back a portion of RSSA earnings if it reentered the market. In the new agreement, this $20.1 million would have to be repaid in two years, down from the original six or seven years. The settlement also calls for commissioning a new reliability study by NYISO to determine if RG&E’s proposed transmission alternative is adequate to replace Ginna. A 2014 RG&E-NYISO study concluded the plant would be needed to maintain reliability into 2018. 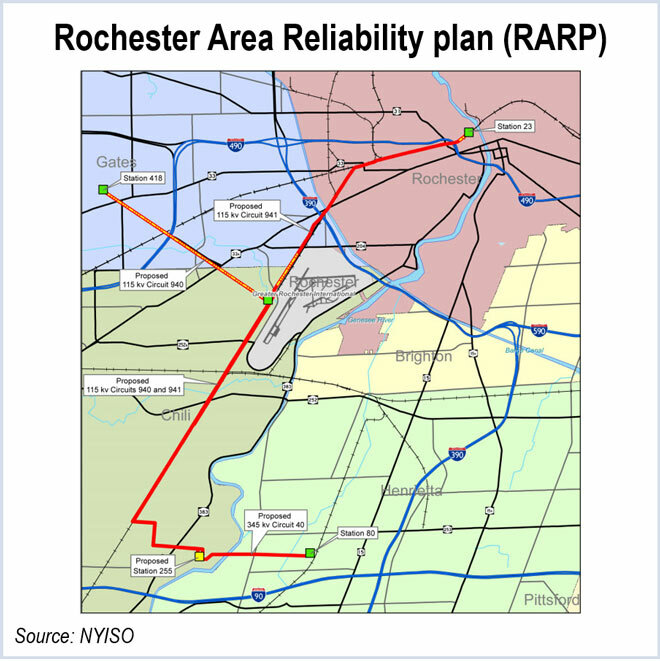 However, RG&E changed its planning proposal from its Rochester area reliability plan (RARP) to the Ginna retirement transmission alternative (GRTA), which will be completed sooner. The RARP is a $250 million project that includes new transmission lines and new and rebuilt substations, intended to address bottlenecks, with only some components applicable to the loss of Ginna. That project will be phased in, with its completion date extended from 2018 to 2020. The GRTA is a $150 million project that was devised to access power from other sources and includes some elements of the RARP. It diverts some of the equipment originally intended for the larger project and is expected to be completed before the RSSA expires, RG&E spokesman John Carroll said. The agreement has been endorsed by PSC staff, the New York Utility Intervention Unit and several intervenors. Entergy Nuclear and NRG Energy, which opposed the earlier agreement, said they will not oppose it. Environmental groups oppose the deal while acknowledging it is an improvement over the original proposal. “The proposed agreement fails to protect consumers and the environment on two accounts. First, the burden for RG&E’s bad planning is being put completely on customers,” said the Alliance for a Green Economy and Citizens’ Environmental Coalition. “Even though RG&E had ample warning since early 2013 of Ginna’s financial challenges, the utility did nothing for a year and half to get alternatives lined up to replace Ginna. The utility’s failure to act proactively will now cost its customers millions of dollars a year, yet RG&E’s shareholders will pay nothing toward the costs of the subsidy. “Second, the agreement contains no commitments from Constellation in regards to responsibly decommissioning the Ginna reactor. Since closure is imminent, it’s critically important for New York’s leadership to get an agreement from the owners that it will begin an immediate, careful and thorough decommissioning process upon shutting down Ginna,” the groups continued. The PSC and FERC said decommissioning is outside the scope of this proceeding. The earlier agreement called for payments to the plant of $17.5 million per month, subject to some adjustments. FERC rejected that agreement in part and directed settlement proceedings that culminated in this week’s agreement. The new agreement would pay Ginna $15.4 million per month. Ginna’s share of revenues from sales into the NYISO energy and capacity markets would be doubled to 30% from the current 15%. The settlement cap for Ginna’s full cost of service has been set at $510 million, with a floor of $425 million. Ginna will not seek a reliability-must-run agreement from FERC. Ginna spokesman Maria Hudson said the plant owners are still looking for a long-term solution. If the latest ISO and RG&E reliability study shows Ginna’s energy is needed beyond 2017, it will bid in to the state’s capacity auction in 2017. FERC approved the plan to keep the Ginna nuclear power plant operating but objected to elements that it said encroached on its jurisdiction.